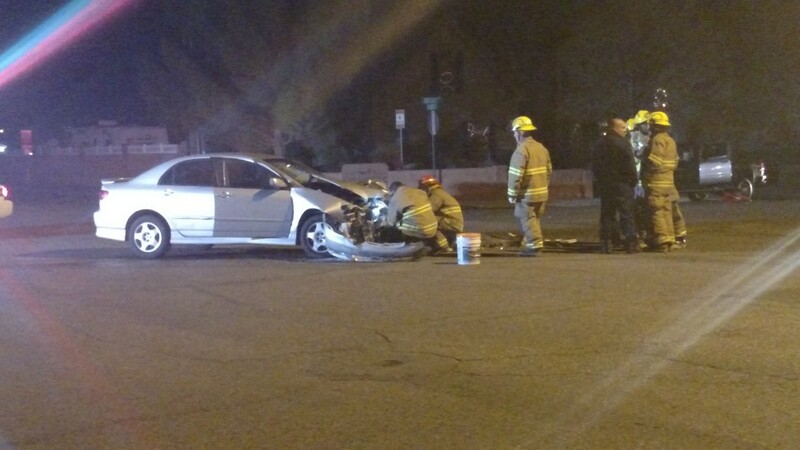 ST. GEORGE – The intersection of 900 East and 900 South in St. George was blocked for about an hour Friday night following a two-car collision. At about 10 p.m., a silver car was heading southbound on 900 East toward the 900 South intersection, St. George Police Sgt. Dave Williams said. The driver of the silver car was using a hands-free device for his phone when he accessed the wrong app and proceeded to try and select the right one. While he was doing this, his car ran through a stop sign and entered the intersection, where it collided with a red car traveling in the westbound lane of 900 South, Williams said. While the red car sustained some visible damage as a result of the collision, the front of the silver car was obliterated. However, nether the driver of the silver car nor the driver and passenger in the red car were injured in the crash, Williams said. Both cars had to be towed from the scene. The driver of the silver car was cited for careless driving. Responders from the St. George Police and St. George Fire departments attended to the scene. So he was adjusting his devise to another APP and had to take his eyes off the road and Bang! I’ve come to the conclusion that these kind of accidents are not the fault of the latest advancements of cellular phones use, hands free or not. Stupid people do stupid things. Maybe the courts should band them from using any cellular phone for a period of time and attend a mandatory AA type program for stupid people. Where they can say; ‘Hello, My name is _____, and I’ve been stupid all my life’. I really like your comment. Until stupidity is outlawed, I don’t see much changing. Intelligent people do stupid things. Using a phone while driving — hands free or not — in an urban setting is stupid. My car phone is hands free and eyes free. I press a button on steering wheel and then say “Call Susie Smith” and it does. But I almost never make a call anyway. On occasion I’ll get a call and then I just press the same button to answer it. No eyes needed. Obviously the person who was this stupid was messing with the phone. My phone never leaves my pocket to use it in car. Meanwhile, another vehicle was traveling in St George with the driver using a “brain free” device. This resulted in the usual collision at an intersection to another vehicle who was traveling along minding their own business. An all to often occurrence here in STG. Take note Mori. (Instant readership). If someone should complain, blame it on the proof reader as being a bigoted, uncaring republican. Instead of letting his fingers do the walking, instead it was his fingers dancing on his device that caused the accident. Did he have a permit for that? Just shows how dangerous that dancing can be. This is a great example of the problems with Utah’s No Texting Law. When the legislature was working to pass SB253 this past session, I knew by allowing “hand free devices” there would still be wrecks (and that they might actually increase). There really are very few true hands free devices. What needs to happen in ban drivers from touching any cell phone while behind the wheel. Do you really honestly believe that if a no tolerance cell phone on in a car that people would really obey the law.? Same type of problem is happening in the Middle East where their considering allowing women to drive with or without proper head gear. So many accidents…so many bad drivers…if it weren’t for the traffic accidents and drug arrests here, reporters here would have very little to report. Or eating, drinking their “pop,” applying make up or yelling at the unruly children who want their Frozen video to replay (for the billionth time). You can pass all the laws you want, but it isn’t going to stop self centered people from doing exactly what they want, when they want it. Of course there are a multitude of other reasons why crashes occur. But they all revolve around ONE thing. Somewhere, somebody screwed up. And it has been going on for as long as there have been motorcars. We need more laws! More laws! That’s the solution! It’s against the law to drink and drive. Yeah that really stopped that didn’t it.? Cracks me up! What a Dumb Pie! Need more laws…..No talking, thinking, or sight seeing while driving, some people are incapable of paying attention. this whole thing is messed up we were hurt I was hurt at the hospital all night why this guy driving was smiling and giggling he is so lucky he didn’t kill us ! phone or no phone he was speeding and also ran a stop sign in a residential area ! It’s time to open our eye’s and pay attention to what were doing …. I could have been killed and feel very blessed that my son and I are alive.